This post is just for sundews |Sundews Etc. Man, it's been feeling like Sarracenia Etc. around here. I must plead circumstance – first of all, I've got a lot of room for new Sarracenia and very little for new Drosera. It's also spring, so all the pitchers are waking up. And finally I keep battling the aphids in my indoor collection. 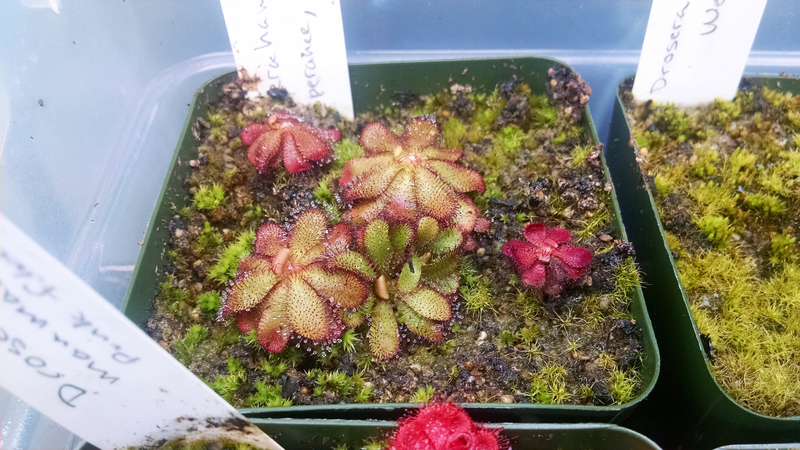 But there's lots going on still, so let's get back to basics and look at some sundews. 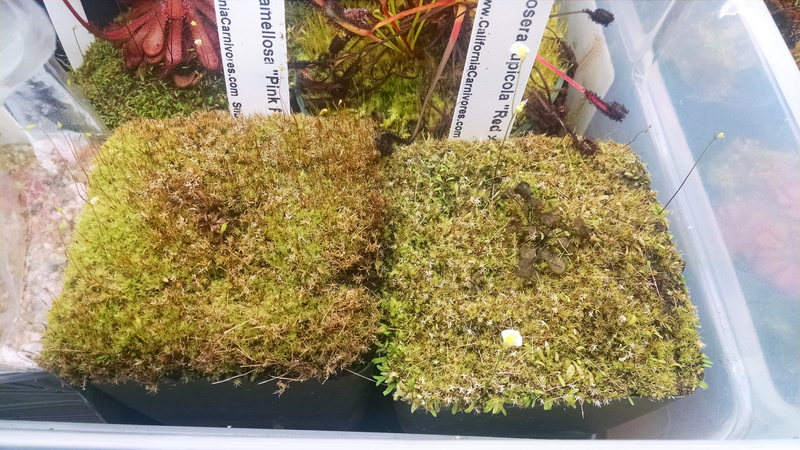 First up, the season is over for my two tuberous species, Drosera ramellosa and Drosera rupicola. 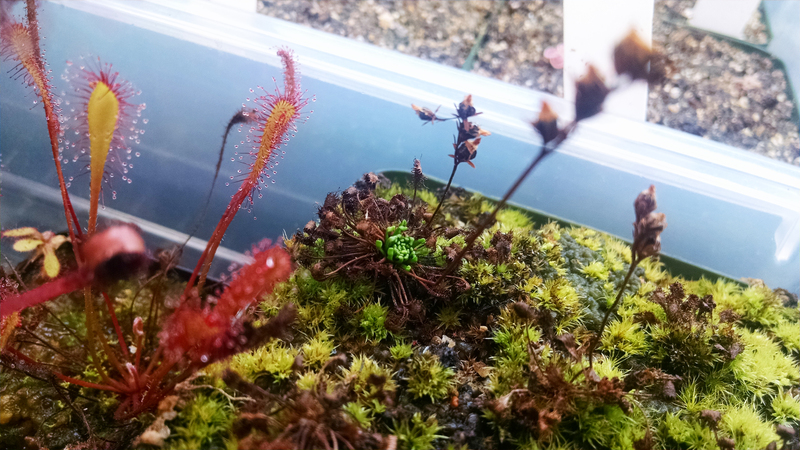 This spot is now occupied by my new Drosera slackii. They definitely went dormant earlier than expected. Now I've set them to dry out, after which I might see what the situation with the tubers is. At the very least I'm going to remove that horrible cap of moss on the pot and replace it with a layer of sand. 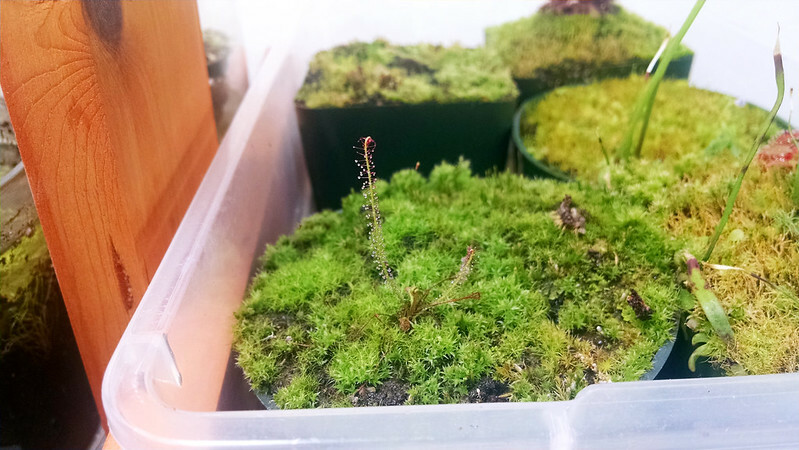 My other summer-dormant sundew, Drosera cistiflora, is still very much awake, and enjoying having been recently fed. It hasn't formed a stem yet this year, and considering how late we are in the season I doubt that it will. Still, I'm glad that it's apparently so healthy. This one will almost certainly come back next season. One of my smaller Drosera filiformis plants has woken up. Always propagate. It's like insurance. This is very satisfying, since the one that was on its way a couple months ago is now, beyond much doubt, definitely dead. The question now is: do I keep waiting? Maybe the shock of being moved up closer to the lights was just too much for it. I'll let the one that's still alive get a bit bigger before the move, I guess. The first of my Drosera intermedia 'Cuba' seems to be waking up as well. This is the only plant among the 3 pots of D. 'Cuba' that seems to be waking, though the others are definitely still alive. We'll see. 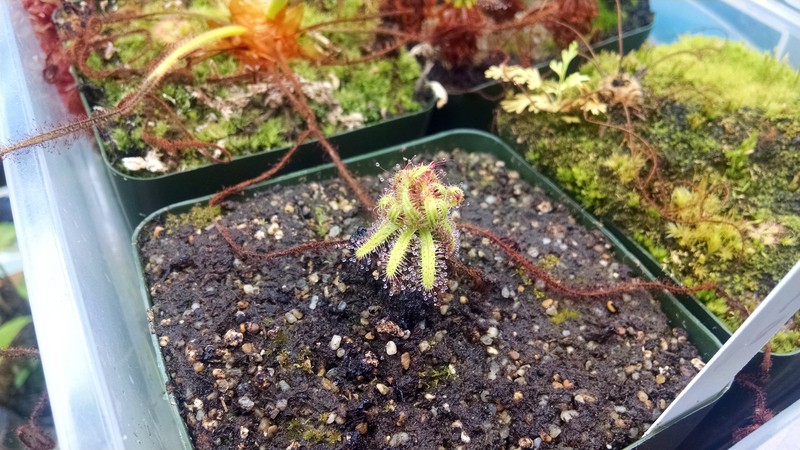 Another Drosera hamiltonii has apparently sprouted from the roots. I didn't expect to see these plants start offsetting. This was sort of a surprise, since this species has always seemed only barely satisfied in my conditions. I guess it can't be so bad. 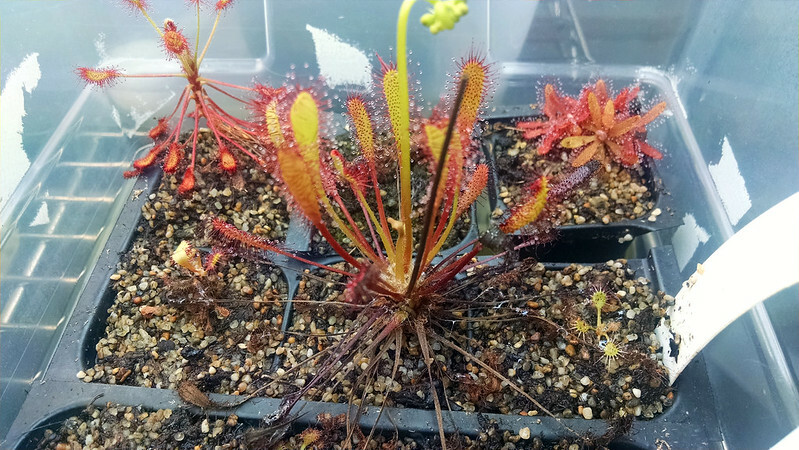 The two Drosera anglica CA × HI plantlets from the Summer Batch that I thought had died have apparently come back. I've fed them, so hopefully in a month or two we'll have some more of this excellent plant available. 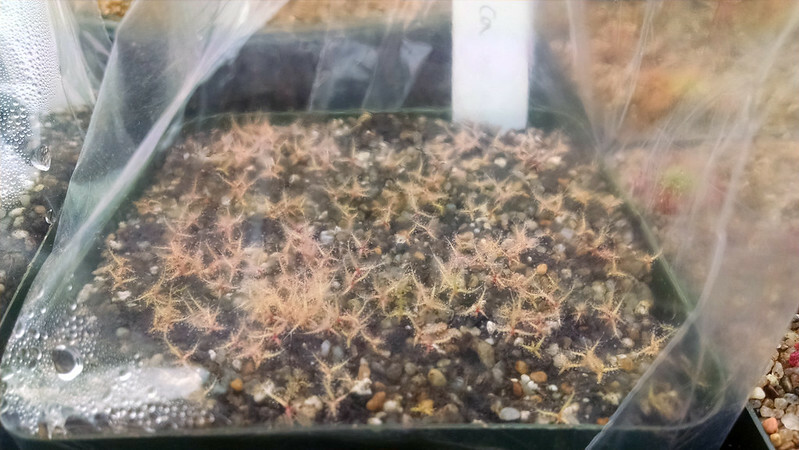 Finally, the Drosera indica situation is still completely out of control. This is too many plants. I'm in the process of hardening these guys off. What I'll do after that is anyone's guess. 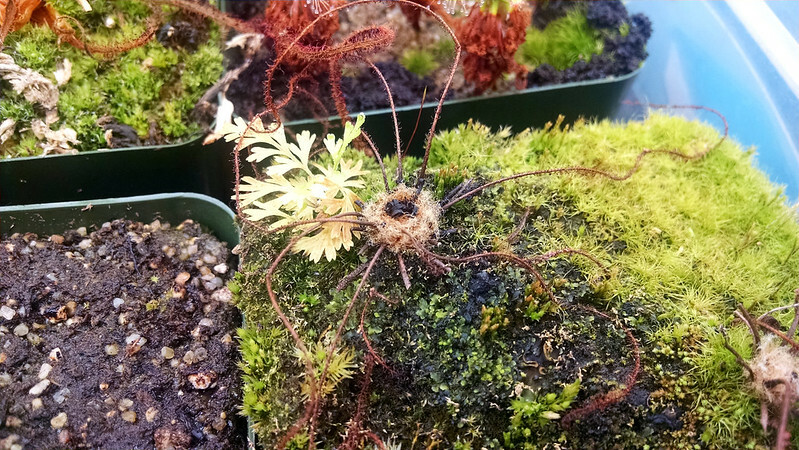 Feels good to get back to sundews! The aphids seem to be in retreat, so hopefully I'll be able to get back to normal sooner rather than later.